After coming across this event back in early December, I'd booked myself a place straightaway. Given the fact there hadn't been once since 2009, it seemed like another one of many coincidences that have led me on the path that I now find myself. And so it was I booked the day off work and headed up on the train from London to Retford. The fields outside were blanketed in snow, forming a beautiful backdrop for the journey. On arrival at the station I met two other attendees, including a fellow Bread Angel - Adri of @BreadandRoll. During the taxi ride we each shared our stories of how and why we were coming along to the event. I was reassured to see that other people were in the same 'starting out' position as me. Then we pulled into the road that led us to the School of Artisan Food. Now here's where we really did start to get excited. Along a tree-lined driveway, a beautiful walled garden appeared, followed by one stunning building after another. What a setting. And to make it all the more picturesque, everything had a snowy topping. As we finally turned into the School courtyard, I couldn't wait to get out and explore. As we got out of the taxi we learned that on the way back we'd be sharing a taxi with Andrew - could this possibly be THE Andrew Whitley. Only time would tell. We stepped into the entrance where we were made to feel right at home and were instructed to sign in and make our badges. Then it was time to head upstairs where a hubbub of noise was emanating from a room at the end of the hall. It was filled with everyone chatting away, drinking warming cups of tea and coffee, and tucking into bread and cheese from the bakehouse next door. I got talking to Vicky of 100% Bread. She'd just launched her Baking School a couple of weeks before, in Canterbury, and was both very excited and terrified at the same time. This turned into a common theme with each and every person I spoke to. But rather than put me off, it just made me want to get going even more. Then at the strike of 1.30pm we were led into the small lecture theatre where we all took a seat and waited for the true masters to take to the stage. Chris Young, Campaign Manager of the Real Bread Campaign, led the proceedings. First up, Tom Herbert of Hobbs House Bakery, and one half of The Fabulous Baker Brothers. He wanted to talk about the importance of baking at home and how this forms a crucial part of the rise of Real Bread. "Hands are made to make things" he started out. "Everything you make at home is a prototype - you then eat it and work out what you can improve next time." He talked about the creative process of bread making. I liked the idea of the 'limitless variables', making it a journey that everyone can take on their own to find out what's right for them. He went on to discuss the importance of baking with children. Most of us have stories from our childhood of learning to bake with our mums, dads, grandparents, etc. These memories hold a dear place in our hearts. By baking with children you are "baking the stories of tomorrow". Which I thought was a lovely sentiment. He made the point that even though some may not understand why you would want to teach and encourage your customers to make their own bread at home, it's important that they appreciate the art for themselves, and understand what goes into each and every loaf. This way you can be assured they will never turn back from real bread. It's also, as I think we all know, a great thing to share. And as Tom put it "it's a great gift, as the recipient feels no guilt of having to keep it." When I went to stay with my friend in Cardiff a couple of weeks ago I took a freshly baked loaf of Pane di Genzano, a batch of ginger biscuits and some homemade chutney. It was wonderful to share my love of food with a friend, and made a much more personal gift, than grabbing the nearest bottle of wine and box of chocolates from the supermarket shelf. Finally, he ended with the plain truth (at least from what we're told by the estate agents) that making bread at home makes financial sense. Apparently, if you bake bread in the morning before your potential buyers arrive to take a look around your home, you can add up to £2K onto the financial value of your house. Next up, Tom Baker of Loaf Social Enterprise. Turns out Tom comes from a heritage of bakers. A former nutritionist for the NHS, Tom had his moment of enlightenment at a Bread conference back in 2009. From some scribblings on the back of a leaflet, he never looked back. The following week he quit his job and set up a bakery from his home kitchen. To make sure he could bake enough loaves he set to work and built his own wood fired clay oven in his back garden. From here, he formed the Friday Bread Club - a community supported bakery - where locals would 'subscribe' to the bakery. Advance payments meant he could invest in the equipment and ingredients needed, and be sure of no waste. He baked 40-50 leaves each Friday in his three ovens. One domestic, one counter top, and the wood-fired one outside. Based in Stirchley, he talked us through how the high street was similar to many high streets in small towns these days - mostly boarded up, with little signs of activity or new business. He'd found what he thought would be the perfect sight for a true community kitchen on his local high street. However, £80K stood in the way of him making this a reality. And so, it remained an idea, festering away in the back of his mind, until one day someone introduced him to the Everards Brewery. They were keen to support local social enterprises and once Tom had talked them through his vision they took no time in stumping up the cash. They paid for the re-fit, the equipment; everything that was needed to get the bakery up and running. From a home-based community bakery delivering to a small group of local subscribers, Tom's bread would now be baked and sold on his local high street for everyone to enjoy. A truly inspiring story to never give up. They now bake 600-700 loaves a week, with just one overnight shift a week. They bake each morning and sell the bread in the shop that afternoon, not a standard set up, but again this relates back to Tom Herbert's point that it's having customers that appreciate what you are doing who can adapt to this way of shopping, rather than the 24hr availability of the local Tesco. Tom has organised the business to suit his lifestyle, and why not. As well as the support from Everards, he set up a Bread Bond scheme whereby he approached 25 individuals to make an investment of £1K each. These were in the form of three-year loans at the end of which they would get their money back with a 6% interest rate. Much of the interest rate was paid in sourdough loaves over the course of their investment! Tom truly believes that baking should be at the heart of every community, a real bread bakery has the power to regenerate a high street as he has begun to show in Stirchley. Baking bread is often referred to as one of those 'forgotten skills' that has missed a generation or two, but through the Real Bread Campaign they're fighting to re-educate and re-introduce these skills back into people's everyday lives. Tom has run many pop-ups and events at home, in the bakery, and on the move, to allow people to get to know his business, the buildings, and the people behind it. Third up was Mark Simmonds of Co-operatives UK, who following on from Tom Baker's story, wanted to talk about the support available to small real bread enterprises. In the shape of 'Making Local Food Work', a community enterprise that connects land and people through food. It's a lottery funded initiative (or I should say was) as this ran out in June 2012. However the initiative was so successful that they secured further funding meaning they can continue to provide support in key areas. Another form of support is through the Co-operative UK's Start-Up Guide, co-written by Mark Simmonds himself. This guide talks you through the process of starting a Co-operative or Community Enterprise and features numerous case studies (all food-related). One of these is that of The Handmade Bakery - one of the first Community Supported Bakeries in Britain, aiming to provide residents with organic artisan bread and re-skilling people in home-baking, based in Slaithwaite, West Yorkshire. Whether you're looking to set up a community-based initiative, or just starting out on your own, it's a handy little turn-to guide. Download it here. Next up was Wayne Caddy, Head of Baking at the School of Artisan Food. I was surprised to learn that the School had only been going for three years. Their aim is to teach students how a recipe hangs together; to understand the science behind how it works, not just to copy the recipes they teach. As any baker knows, it's all in the senses... "Feel the dough." The School uses both technical and sensory tests to guide students' learning and they encourage everyone to develop their own signature recipe. Emmanuel Hadjiandreou (Manny), author of 'How to Make Bread', then took the helm. He talked about the joys of teaching the art of baking bread. The dead silence as the oven door opens and the students see their loaves: golden, risen and unique. And the attachment each student feels for their own 'rustic' loaf. Again he talked about the beauty of teaching children to bake. He'd recently taught a class of 59 to bake bread at his son's school. "They listen to you and just do it. No asking questions. No how, or why. They just get on with it. But the look on their faces, the shouts of 'wow', 'look at that', and the dead calm on seeing the loaves, is the same for both kids and adults alike." Chris Young, Campaign Co-ordinator of the Real Bread Campaign then stepped in once more to introduce the final speaker of the day. "Bread starts as a seed in the ground. We need to look at improving the starting point, the actual grains themselves, to truly make a difference and produce real bread." And then finally Andrew Whitley took to the stage. 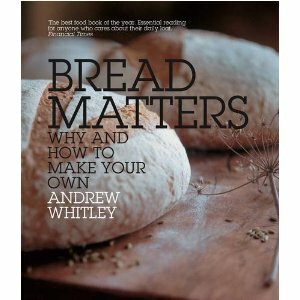 Founder of The Village Bakery in Melmerby, and author of 'Bread Matters'. His aim is that "Everybody should be in walking distance of a loaf of real bread." Whether that be the walk across their own kitchen, to their neighbour's, or the local bakery. He talked about the changing face of bread and the importance of the grain. There's a long change from seed to plate, creating a disconnect, where compromises in quality are made, to speed up the process and make bread look more appealing to the customer. Ie Additives and preservatives. It should clearly be a significant public health concern that the grains used in bread, no longer agree with a growing part of the population. The best bread should provide benefits of 'health', 'contentment' and 'joy', not leave you feeling 'fractious' and 'disagreeable'. "We need to make the connection shorter. And somehow 'Tesco-proof' the concept. This relies on forming the process around a chain of people that is not saleable." A co-operative therefore does seem to be the answer. "We need to create maximum diversity in seeds, developing more secure and resilient forms, to sustain the making of real bread." He pointed out that very little scottish wheat is actually used to make scottish bread, instead it is distributed far and wide. This needs to be changed. We need to be living off the land on which we live, shortening processes and working with those around us for the common good. He ended with the following rally for support. "The bread is rising. You bet it is!" After the talks, it was time to chat and eat more bread of course. I had some interesting conversations with a few start-up micro-bakeries, getting insights on the problems they were facing and how they were going about trying to build up a customer base. Alison of Real Slow Bread said she was getting concerned she'd forgotten how to make a good loaf of bread as she'd got so caught up in the numbers and getting her accounts set up. Before the taxi home I wanted to take a look around and so headed down to the Welbeck Bakehouse with a few other bakers in tow. 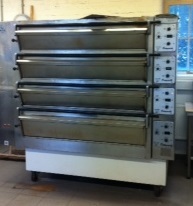 As we turned the corner into the bakery, we got a first glimpse of the 5 tray oven - what a beaut! Dough was being mixed in what I can only describe as a large-scale Kitchen Aid. And then our eyes caught sight of the bread. Wow, they'd gone to town baking all sorts of wonderful types of bread, from focaccia to baguettes. I was sadly feeling full after the bread and cheese I'd already been helping myself to but managed to find room for some apple and cinnamon bread - I'd never had anything like it but am now determined to have a go at making my own. They'd made so much we even got to take a loaf home each, not one to look a gift horse in the mouth, I helped myself to a tasty looking seeded loaf. 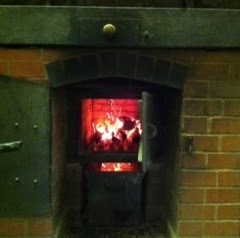 Next it was time to take a look at the source of wondrous heat that was emanating into the kitchen. The home of the wood-fired ovens! They were truly huge, and the heat was fantastically warming on such a bitterly cold day. I was transfixed. Despite their size, they had such a charm and character about them. You couldn't really get a full feel for how big they were until you saw the size of the peel - I'd estimate it at about two and a half to three metres long. Manny talked us through the process of loading and unloading, and the art of getting to know your bread oven. It's hot and cold spots, how these could often change one day from the next - much like in a relationship! Then it was sadly time for us to leave this beautiful bready oasis. But alas the fun was not over yet, my hopes and dreams came true, when taxi Andrew did turn out indeed to be Andrew Whitley. Myself and fellow Bread Angel Adri of @BreadandRoll could not quite believe it. On the road he told us his story of how he started up. 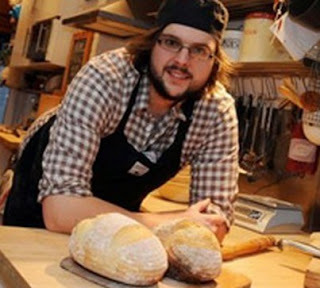 Like us he was originally based down in London, but made the move to making real bread up in Cumbria. Wanting to do something similar myself, I fired question after question to him, highlighting my concerns of making such a move on my own. He put my mind at rest with his tales and experiences of how he had headed up to Cumbria despite being told that there was no demand for wholemeal bread, and that people didn't even know what organic meant (this was back in the 70s). With his friends back in London asking who he would talk to up there, he told of the community spirit he encountered and how he had formed bonds with people on a level he had never really achieved in London. He went on to talk about some of his experiences in Russia and what he'd been up to since taking leave of the Village Bakery. He truly was one of the most genuine and approachable men I've ever had the honour to meet. Even once we'd arrived at the train station we carried on the discussion, moving onto the Real Bread Campaign - what it is trying to achieve and the obstacles it's facing. If you're passionate about real bread and the difference it can make to people's lives you really should become a member. And if you already are, you should seek to get another to join. They need our support. To end, all I can say is a massive thanks to the Real Bread Campaign for putting on this event, for free, and to the School of Artisan Food for hosting it, and to all the speakers and bakers that came along. I'm so happy I took the plunge and dived right in. I could not have asked for a better day. What's more I'm still reliving it making my way through the tasty loaf I received from the Welbeck Bakehouse.